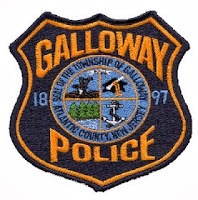 Olivia Tarver, 61, of Galloway Township was arrested by Det. Ryan Goehringer for Fictitious Police Reports on Oct. 13. Michael Morrison, 20, of Galloway Township was arrested by Cpl. McGinty for unnecessary noise on October 13. Jonny D. Fernandez Jr., 20, of Lancaster PA was arrested by Ofc. Vincent Ceci for fugitive warrants on October 14. Mtume Goodrum, 32, of Galloway was arrested by Ofc. Ronald KGorneau for attempting to elude police on October 14. Anthony S. Barnes, 28, of Somers Point was arrested by Ofc.Christian Magazzu for hindering apprehension on October 14. Larry Huggup, 30, of Hamilton Twp. was arrested by Ofc .Kerry Baerman for possession of less than 50 grams of marijuana and hindering apprehension on October 15. Luis J. Camacho, 19, of Galloway was arrested by Ofc. Przemyslaw Ryba for possession of less than 50 grams of marijuana on October 16. Richard W. Lerner, 66, of Galloway was arrested by Ofc. Dan Weigle for shoplifting on October 17. Eric Schocklin, 20, of Galloway and Ryan M. Brooks, 20, of Succasunna NJ were both arrested by Ofc. Pat Neal for continued unnecessary noise on October 18. Wazira T. Walton, 34, of Galloway was arrested by Ofc. Christian Magazzu for reoccurring Township noise Ordinance violation on October 18. Robert M. Russo, 42, of Glendora NJ was arrested by Ofc. Ronald Gorneau for possession of less than 50 grams of marijuana and possession of drug paraphernalia on October 18. Gavin C. Snyder, 23, of Manahawkin was arrested by Ofc. Bill Kline for possession of a hypodermic needle on October 19. A 17 year old male was charged on October 16 by Ofc. Przemyslaw Ryba with possession of less than 50 grams of marijuana.